The transmission is in neutral (the neutral switch is closed). The clutch lever is pulled to the handlebar (the clutch switch is closed) and the sidestand is up (the sidestand switch is closed). The starting circuit cut-off relay prevents the starter motor from operating when neither of these conditions has been met. In this instance, the starting circuit cut-off relay is open so current cannot reach the starter motor. 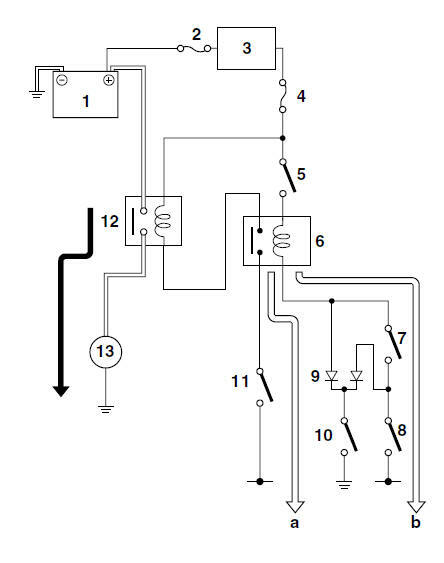 When at least one of the above conditions has been met, the starting circuit cut-off relay is closed and the engine can be started by pressing the start switch "